The Japanese are famous for many things – most good, some weird but always very distinctive. The characteristics that I was reminded of when reading Yasushi Inoue’s classic ‘The Hunting Gun‘ were the love of precision and the national skill of keeping things focused and tightly controlled. This book is like a perfectly arranged single flower, deliberated over by the arranger for hours to eliminate any possibility of imperfection. The brevity of its 74 pages (of which 12 are introduction and commentary) reminded me of the much-loved haiku poetry format where restricted length enforces consideration of every syllable that hits the page. Yes I’m aware that this all sounds ridiculously pretentious but this little book squeezes more emotion into just 62 translated pages than most authors can fit into many hundreds. It is a tiny, precious work of art that lingers in the mind of the reader long after it’s finished. I’m completely captivated by this complex love story, related only after the facts and by a narrator who’s entirely detached from the action. I don’t often use the word ‘extraordinary’ but this time I do in its true sense – The Hunting Gun is truly something way outside the realms of the word ‘ordinary’. I don’t recall where I got this book or when. I found it tucked amongst fatter and more assertive books when I was clearing my shelves to make space for new books. It bears a price label of $13.50 but I’m sure I didn’t buy it in any dollar-using country. Finding it was like opening a box and revealing something valuable that you forgot you had and hadn’t missed and then wondering how you got along for so long without it. 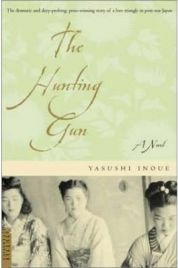 The Hunting Gun is set in Japan just after the end of the Second World War. It was a harsh and sad time in Japanese history when the once great nation was licking its wounds after defeat and questioning who and what it was and how to rebuild a sense of worth again. However, despite the significance of the time when it was written, for the reader there are few clues that place the story at any particular historic point. It’s a story that could happen anywhere and at any time. It’s a timeless story of forbidden love revealed. The book opens with the narrator explaining that he’d written a poem for a magazine in which he described a man walking in front of a mountain with his hunting gun over his shoulder. The narrator has no great recollection of what had prompted this story until he receives a letter from a man who claims to be the hunter who has been described. The narrator realises that it was the outward expression of loneliness that drew him to the man. Despite there being no connection between the two men and this being their first contact, the hunter has sent three letters to the narrator, apparently hoping that their content will help his unknown observer to understand the loneliness that he recognised and described. He asks nothing from him other than the time it will take to read the letters. The letters are from three women who are connected both through family ties and through the hunter. Shoko is the first letter writer and is a 20 year old who has just discovered from her dead mother’s diary that her mother and the hunter were lovers for many years. The second letter is from the hunter’s wife Midori, revealing that she knew all along what was going on, exacting a small revenge and requesting a divorce from her husband – all very politely as you might expect from a Japanese woman. The third and final letter is from Shoko, the mistress who lies dying and reflecting on her role as sinner, liar and lover. That really all there is to this book. No complex back and forth of letters, no repeated cycles of communication and no sudden revelations of hidden events and emotions. Just three letters – each of them bursting with different emotions and each relating to the same relationship. We know nothing of what happens next and we don’t need to. Like the flower in the vase, adding one more page or one more twig or leaf would spoil what’s already tightly pared down to the minimum required to move the reader. The edition I have was translated into English in 1961 by Sadamichi Yokoo and Sandford Goldstein and I worried that the act of translation might have lost the differences in the voices of the three women but the translators have done a fantastic job. Each of the women writes so differently that we can deduce a lot about them from the way each letter is written and from all the things we see that don’t need to be explicitly written down. The daughter is angry, cheated of the love of both her mother and Midori by the discovery of her mother’s secret. This anger is mixed with the emotional loss of finding herself without a mother at such an early age. The wife’s letter shows she’s clever, classy, rather polished and a bit vengeful after keeping her secret for 13 years. And finally the dying lover is reflecting sadly on the secret relationship and whether anything will remain after her death. If you took all the pages, mixed them up and then dipped into the pile of papers at random, you would know instantly which woman was writing. You will probably not find it easy to get a copy of this book. Amazon lists it only in second hand and mostly over-priced editions. If you can get it though, you’ll be in for a treat. This tiny volume packs more punch than most books many times bigger and brasher. For those who don’t like ‘foreign’ books, there’s little that you need to know about Japan or the Japanese that will stop you from understanding a simple tale of three women connected to one man through one forbidden relationship. One Comment on "The Hunting Gun"
The best things come in small packages as they say. Sounds powerful.